They race through them to go out, whether it’s the front door, the car door, the crate door or… well, pretty much any door. When someone comes through a door, all hell can break loose! Dogs can transform themselves from a lazy lump on the floor to a jumping, lunging, growling, barking, nipping, spinning, pacing crazy thing in two seconds flat. Why? Clicker training establishes a rock-solid line of communication based on simple cause and effect. The clicker – a small mechanical device - makes a sound that “marks” a behavior (the cause) and tells the animal precisely what he’s about to be “paid” for. The reward (the effect) that quickly follows strengthens the behavior, making the animal want to repeat it to get another click and reward. Read more about “Clicker Training” without a Clicker…and without Treats? Read more about Say "no" to "socialization"
Are you and your house ready to bring that puppy home? An in-depth guide for people planning to add (or who have recently added) a new puppy (or dog) to their household. We as a culture (or maybe as a species), have a strange hangup with food. Food fills us with emotions and assumptions and strange relationships (chocolate!). There are still a lot of people who have a hard time even considering using food for training, thinking it somehow will diminish the relationship of that perceived (ugh) alpha status we so strive to hold over our dogs. Food is quite simply a tool, just as fetch, attention, affection, praise and others are (or money, play, vacation, etc. are for humans). The difference is in how the dog values these things at any given moment. We try to be ready for it here at "Camp Logan." With multiple dogs in the house, it can be challenging to keep things clean when 8-20 dirty paws are coming through the door many times a day. Luckily, there are many options to help get us through this messy time of year. Read more about Mud Puppies! We share a serious obsession with our canine friends: a passion about moving round things. Balls. Balls of all sizes and colors and textures incite incredible excitement from both species. Getting older… and getting a dog, too? As we get older, we find ourselves “downsizing” in many different ways, one of which might be getting a smaller dog for our smaller living quarters. 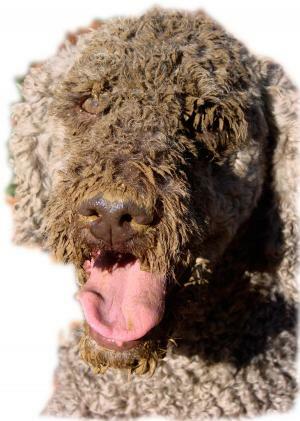 In fact, here in Loganland, our next dog will most likely be smaller than our 60# Standard Poodles. Read more about Getting older… and getting a dog, too? Prevention: The Best Training Tool! A crate is simply a playpen with a roof. Baby gates, cribs, bouncy chairs, playpens, safety latches, car seats, outlet covers, kid-safe containers…. these are just a few of the many ubiquitous items used to keep our young children safe; some even required by law. We accept the fact that 2 year old Tommy doesn't "know better" than to explore the cabinet under the sink, so we are proactive in installing safety knobs to keep him - and the items inside - safe. A lone toddler in a non-child-proofed room means disaster. Likewise, we don't allow toddlers to investigate their surroundings unsupervised. Read more about Prevention: The Best Training Tool! Two dogs at the veterinary hospital. Two different approaches to training. We recently found ourselves at Angell Memorial Hospital in Boston with Dory, our 12 year old Standard Poodle. She was there for throat surgery and her humans were nervous, to say the least. It was tricky surgery and post-surgery might be challenging, too. For many of us with dogs, it's not a happy time at all. In fact, we dread its arrival, can't wait for it to be over and would love to be able to crawl into a deep, dark, quiet cave with our beloved canine companion for the duration of what is supposed to be a celebratory time for our country. On Dogs and Fireworks: An Unsafe Combination. Hear that? Well, your dog hears a LOT more. Puppy Biting and Nipping….. OW! Consequence drives behavior... even with puppy biting! Puppies use their mouths a lot to explore their world and it can be very painful for those at the receiving end. This behavior is a normal part of development - they need to mouth and chew as much as a human infant needs to teethe. At the same time, puppies must learn to respect human skin and clothing and understand where the line is so that they don't develop a joy of "mouthiness." They can grow into this behavior rather than out of it! Read more about Puppy Biting and Nipping….. OW! "Why aren't dogs allowed to meet and greet on leash?" is a familiar question I get. I have a rule against dogs interacting on leash - even in my puppy classes. Some people are not pleased at all with my rule, but I know the dogs were very appreciative of it, and it is written uniquely for them! First of all, why should they have to? Besides their humans getting misplaced warm fuzzies about how cute it is for their dogs to "make friends," meeting on leash doesn't offer a lot of positives from the dogs' perspective. Anytime your dog wants something is the perfect time to train! How true it is. If we have conditioned a lot of “wants” into our dogs and we are in control of access to them, we have so very many options available to us! Take the food bowl, for instance… it’s a common thing to have rules around when and where a dog can eat his “meal.” If you don’t have any or want to get to the next level, here’s a little training video I did years ago that can help. Even if your dog already does a sit/wait, there are lots of other things you can do with this exercise. Oh, it was such unconventional thievery – while young Sophia was looking the other way, Astro cunningly approached her, found the wallet in her jeans back pocket, carefully pulled it out and brought it to me. Good boy!! This could be a nice sideline for my 2.5 year old Standard Poodle. It would be great if the dogs could pay for their own room and board; now perhaps there’s a chance! He was a large dog. Not large TALL. Or large LONG. But large AROUND. This was a Portuguese Water Dog and he was blatantly obese. I was at an off-leash park with a bunch of dogs and my instant reaction was that of disbelief when I encountered him. My jaw dropped and without thinking, I addressed the fluffy black blimp with, "oh, you POOR dog! You are SO FAT. Don't your parents like you?" Read more about "He Loves to Eat!" Please… Don't Fully Train your Dog! Hmm…. that must seem rather odd for me to say, given that I'm a Certified Professional Dog Trainer and make my living training dogs and their people. Huh? What's up with this anyway? Read more about Please… Don't Fully Train your Dog! Welcome to my blog. Here you will find tips and musings about my latest adventures, training experiences and general commentary about Life with Dogs. I invite you to register and comment!